What is a â€˜landing pageâ€™? As mentioned above, a landing page is the first page a visitor sees when they come to your site. Â It’s the page that gives people their first impression. These pages are importantÂ because you want to draw people in to your site and encourage them to come back. Â Knowing your most popular landing pages and working to improve them is a key way to improve your online results. How do you findÂ your important landing pages? Boom. You will see a list of the top landing pages – the entry point of people who come to your site. – Likely your home page ( shown as /, index.php, index.html, etc.) is your most popular landing page, but don’t be surprised if it’s not. – “Sessions” shows you how many visits to your website started with the particular page. – If you can’t make sense of the page paths ( /this-path/another-path/that-page ) that Google Analytics shows you, setÂ the “Secondary Dimension” toÂ “Page Title” as shown below. Â Now you’ll see the title of each of your top landing pages, not just the confusing page path. Which landing pages need love? So now you know the most important entrances to your website. Â What do you do with that information? Â Â You use Google Analytics to show youÂ which landing pages areÂ working, and which areÂ not. And then you can work on fixing the latter. The key number we’re going to look at is the “Bounce Rate” of these top landing pages. Â The ‘bounce rate’ is the percentageÂ of people who come to a particular pageÂ and don’t visit another page on your site. Â They ‘bounce’ in the slangÂ sense – ie. Â ‘leave or exit‘ – after only viewing one page. Landing pages with a high bounce rate are not helping you – people see them and they don’t want to see anything more on your site. Â These pages are making a bad impression, and you need to fix that. 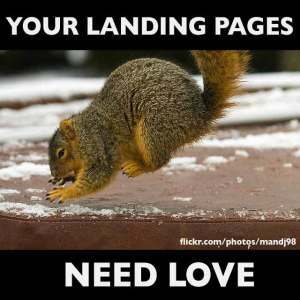 Here’s how to find your the landing pages that need your love the most. Â Look at the right-hand side of the top of the table of landing pages we previously looked up. Â There are a group of icons to switch the views of the table below, one of which is ‘comparison’Â – click on this view. We’re using the ‘Comparison’ view of the landing page report to see which popular landing pages on our site have a higher than average bounce rate. The comparison will default to ‘Sesssions’ – choose “Bounce Rate” from the drop down, as shown above. If you’re unlucky, your comparison table view will now look like the one above. Â Notice that the top landing page, with 62000+ visits that month, also has a bounce rate that is higher than the site average. In this case, the most important entrance to the website is also 23.55% more likely to repel visitors than the average landing page. Â That needs to be fixed, or a large number of first time visitors will continue to get a bad first impression of your site. This is an extreme case, but it illustrates the point: you are looking for important pages that have higher than average bounce rates.Â Using the bounce rate of a particular page – especially an important high-traffic one – is far more useful than the overall bounce rate of your website. Â It gives you actionable information, not just a nice-to-know metric that still leaves you confused. Take some time to look at these ‘red’ landing pages and see how you can make them more attractive. What you could do to encourage people to stick around: tightly focusedÂ content? more relevant internal links? better calls to action? Now you’re using Google Analytics to tell you more than just how many visitors came to your site – you’re using it to optimize your site, and make the most of your limited time and resources.Â You’re developing better Data Habits. – A high bounce rate on a landing page is not always a sign of problems. Â If the page is not meant to encourage people to stick around your site, don’t worry about high bounce rates on those pages. Â An example is an ‘hours of operation’ page. – To super-charge the technique above, you can add Segments to the above reports, and find out your top landing pages from search, social, referral and email. Â Not sure how to do that in Google Analytics? I have a tutorial that covers audience segmentation, a key data habit. – This post was inspired by a New Organizing Institute ‘Tip of the Day’ post about popular content. Â You should check them out if you’re working to make the world a better place.